As the cold weather continues to ravage Long Island and the heat keeps running it helps to be aware of the threat of ice dams. Ice dams form when there is snow on your roof, the surface of your roof is above 32° F and the air outside is below freezing. As the snow melts and runs down your roof it reaches the end of the roof, gets colder and refreezes forming a ridge of solid ice at the eave. Falling icicles can become a hazardous issue as the weather gets warmer. The icicles themselves can loosen shingles or even tear off gutters. There are some steps you can take in order to prevent these menaces of winter from becoming an issue. 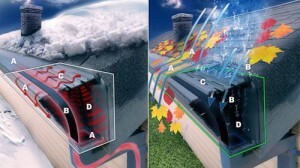 Properly Insulate Your Attic: heat escaping from your attic causes the snow to melt and start forming ice dams. By having your attic insulated properly a minimal amount of heat escapes and air ventilates which minimizes the risk of ice dams forming. Rake your roof: Next time you go out to shovel your driveway, consider raking your roof. Because a primary cause of ice dams is the snow on your roof melting, removing the snow in the first place can prevent them from forming. We suggest getting a roof rake with wheels so you don’t damage the shingles on your roof. If Ice Dams continue to plague your winter season contact us at Pro Quality Home Improvements to see how we can use our precise air sealing techniques to eliminate this issue today!